For our league day I...played something else. Gotta get back in and catch up on league games next week! 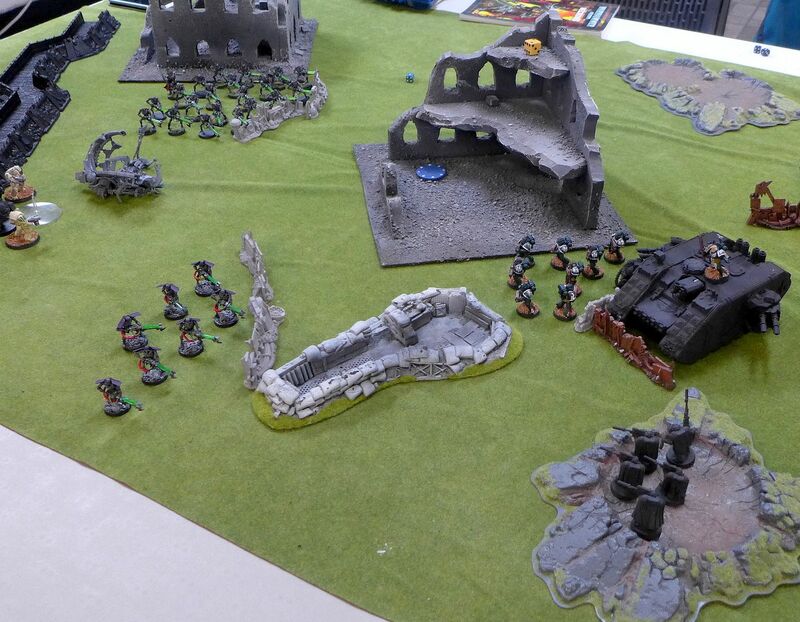 Instead I played an 1850pt game against Scott's Space Wolves to help him prep for an event he plans to attend. We ended up with a game of Relic. I loaded up on Scythiak, breaking out the Ogryn with attached psyker and priests plus some daemon-summoning Wyrdvane squads. 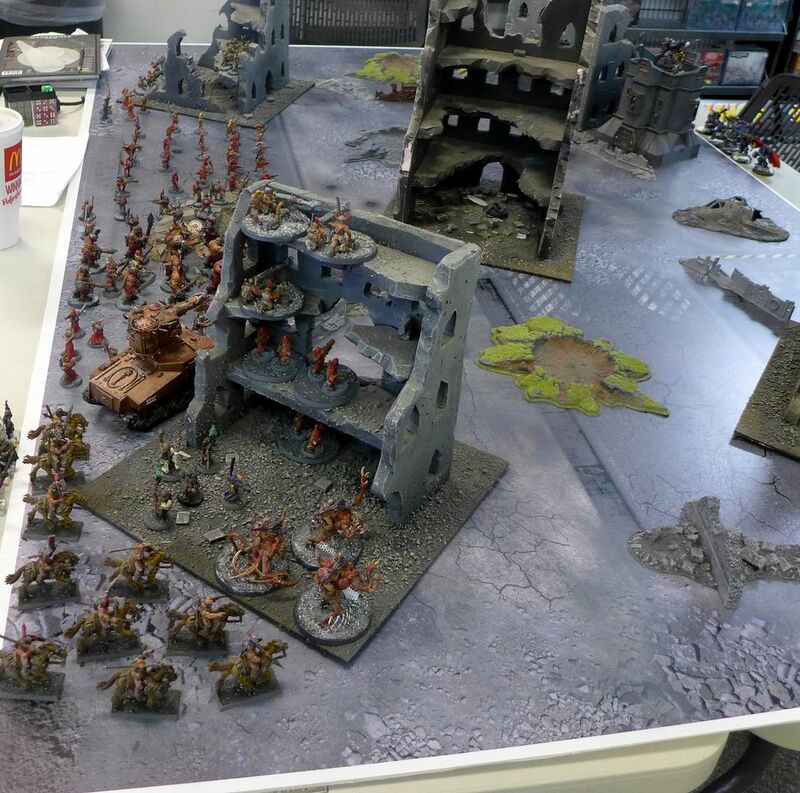 We played on a wonderful table one of our new players, Ben made. 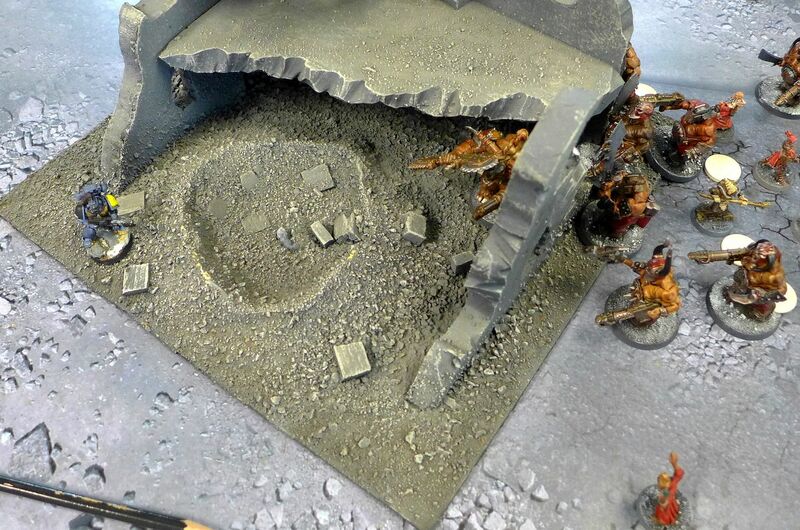 Looks great, especially with my grey rubble bases. 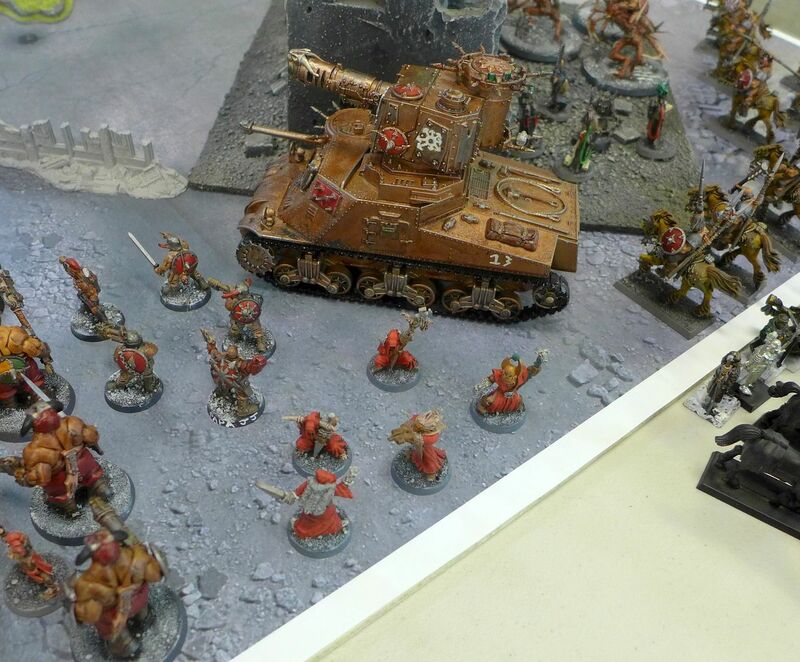 Here we see the Scythiak strung out, with the tank running as a Demolisher. 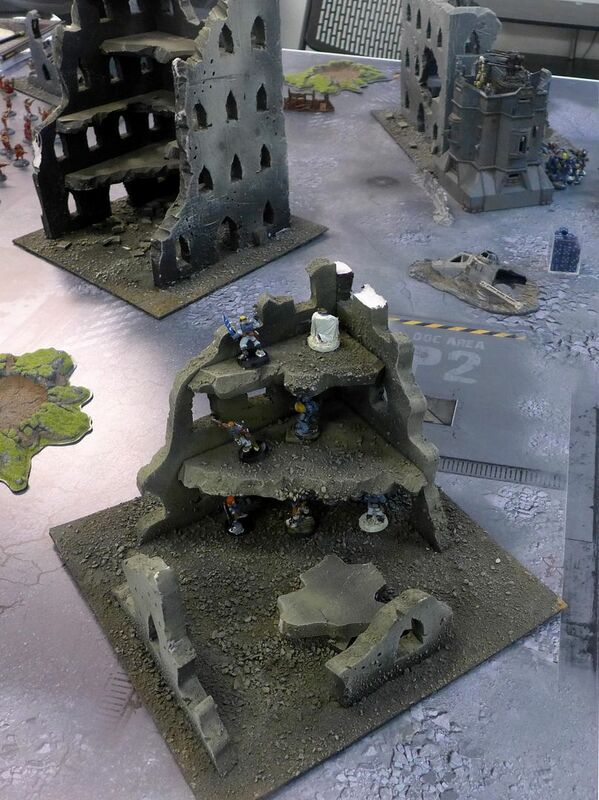 Relic in the central ruin with an access hatch nearby from the Space Wolf bastion on the far side. 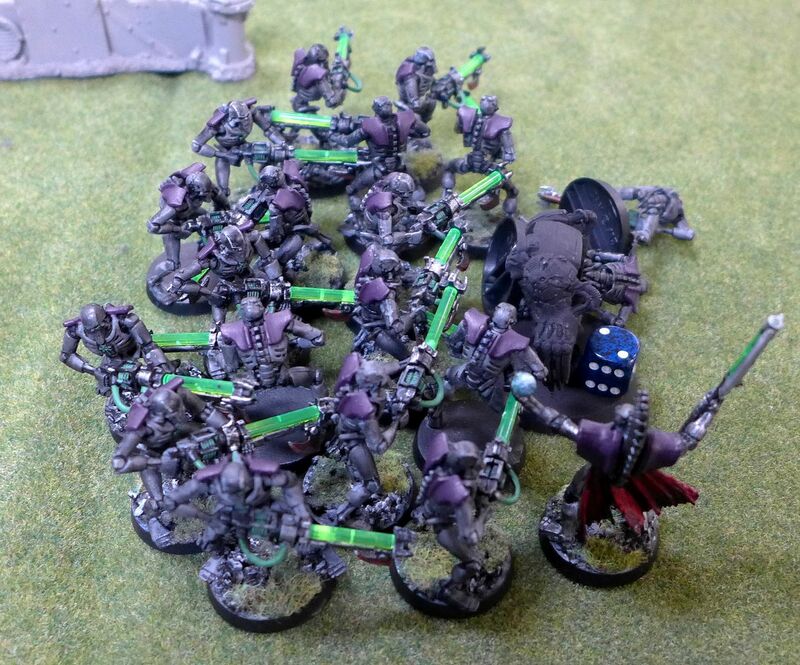 One of the psyker squads ready to unleash the warp. 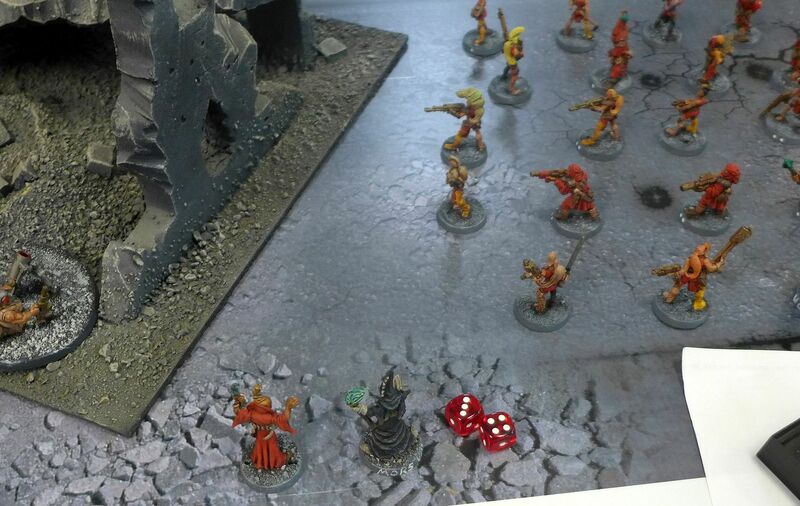 The other psyker squad on the left flank. 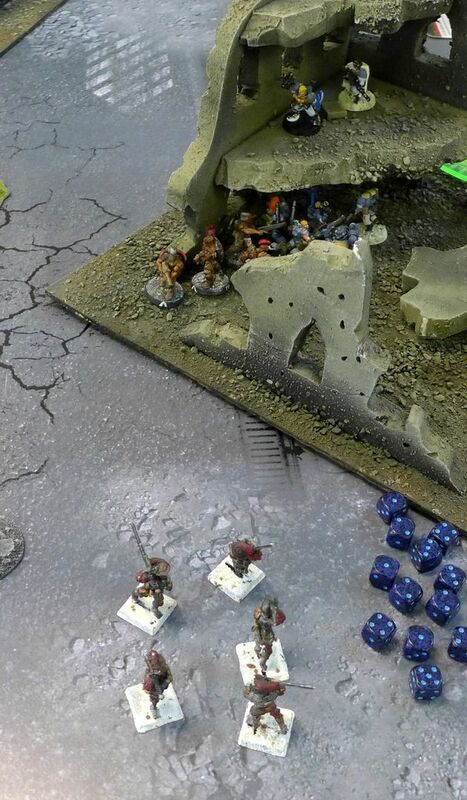 Space Wolf snipers set up to harry the Scythiak advance. 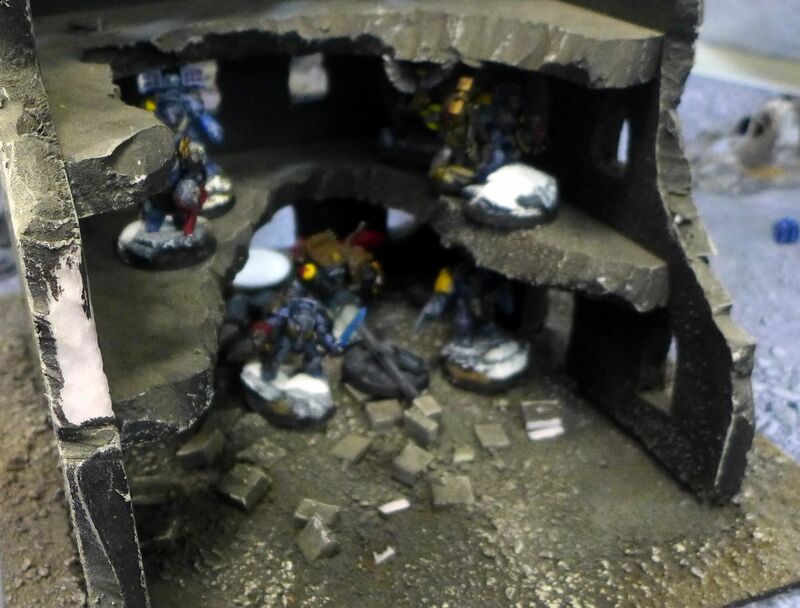 Terminators set up inside the bastion ready to pounce out of the escape hatch with Long Fangs ready to occupy the fort when they leave. 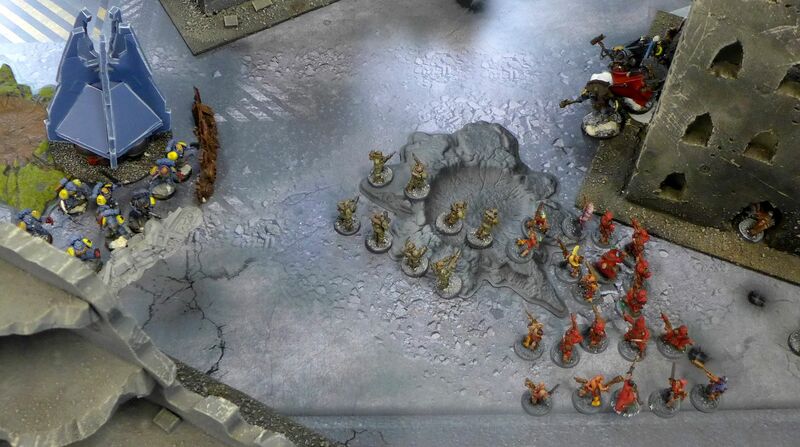 Following Scott's trend of stealing initiative the Wolves get the jump on the Scythiak and move to seize the relic. 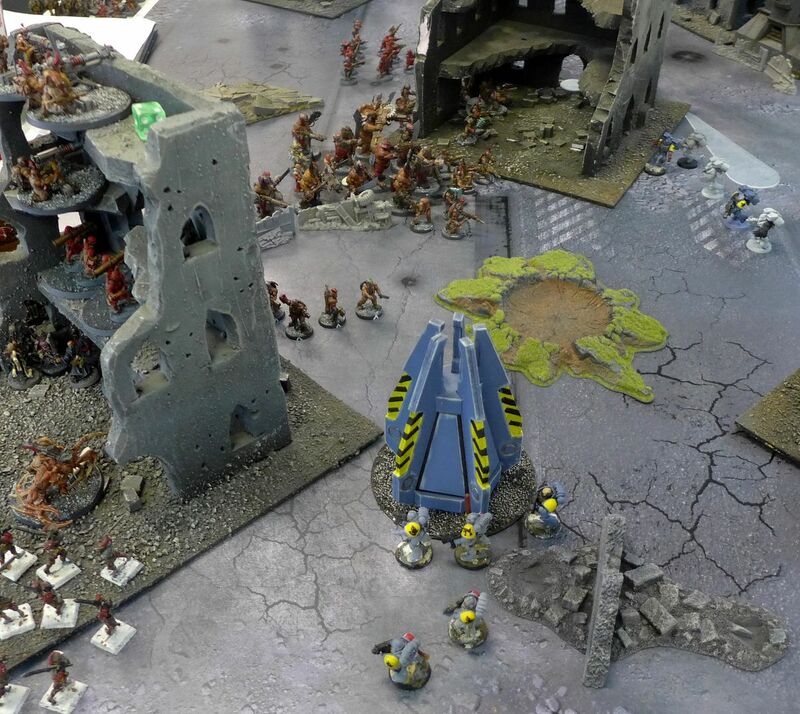 Meanwhile the Long Fangs snap fire some krak missiles and emplaced heavy bolters into a psyker squad, trimming them down. Drop pods slam down. Meltas damage the demolisher, immobilizing it but leaving it still able to fire. 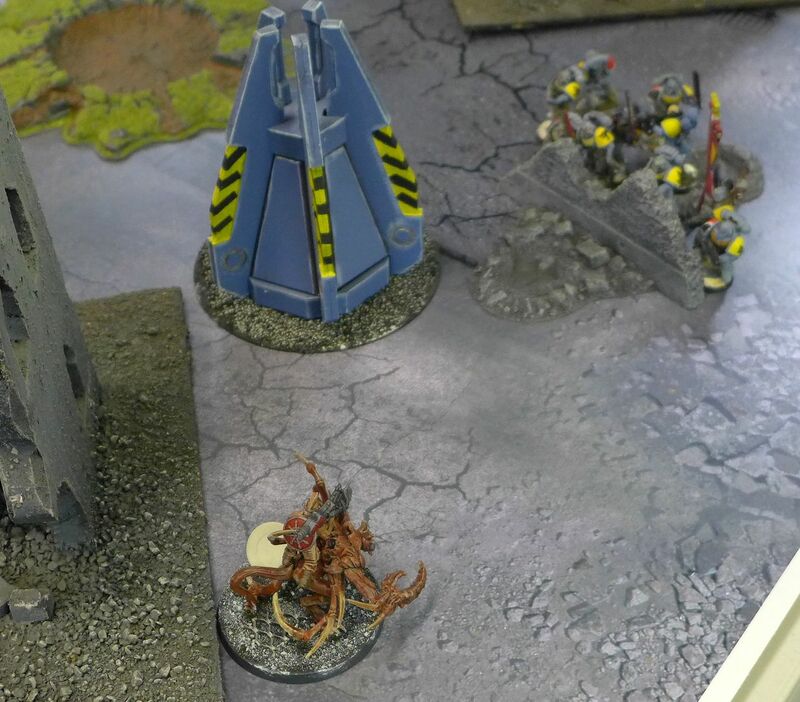 Another Grey Hunter pack takes down two spawn-riders but fails to wipe out the unit. Retaliation! 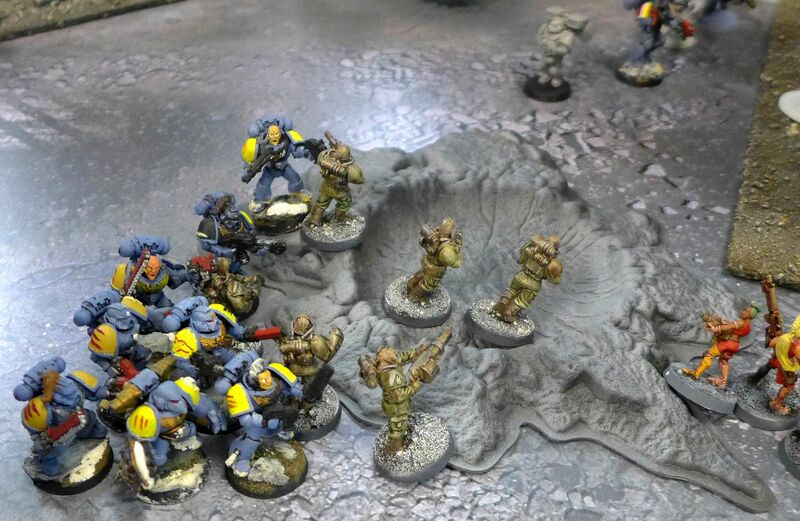 Heretic firepower takes out a Grey Hunter pack, earning First Blood and protecting the demolisher from more melta hits. 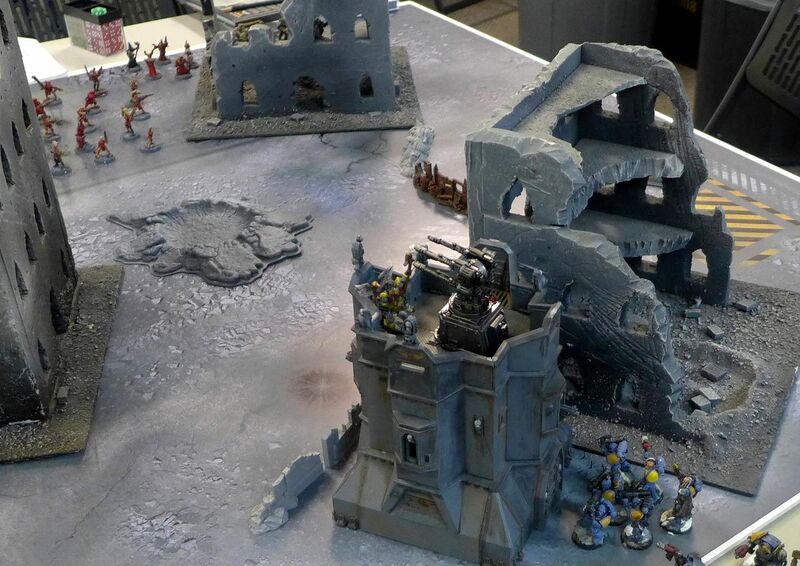 Luckily the Space Wolves just ALMOST destroyed three units but couldn't put one down with their first strike. More retaliation! 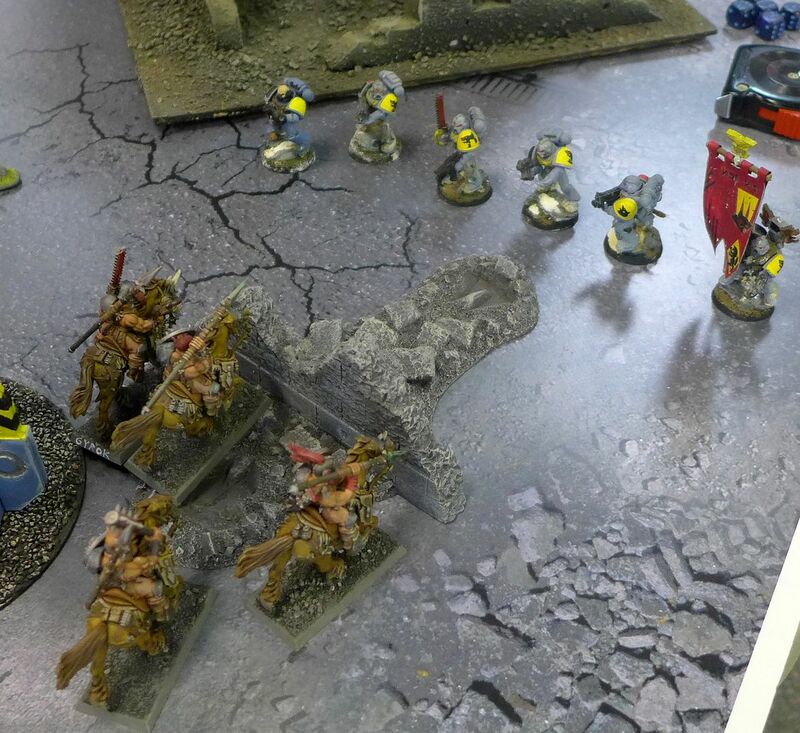 The Scythiak advance and pour fire into the terminators, killing many, but not all. The Wolves still hold the Relic! 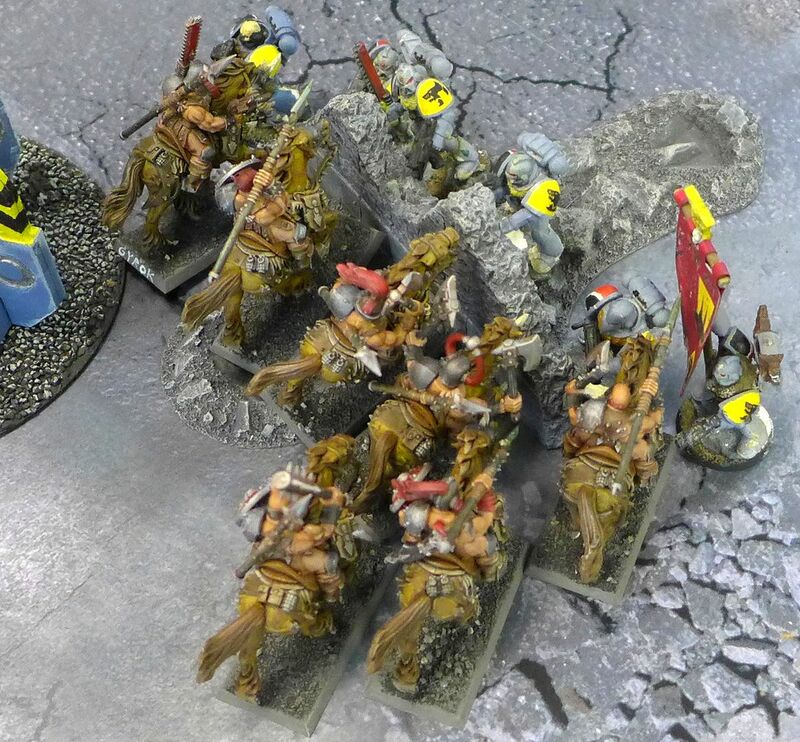 I made this one big as it's a rare sight in 6th-7th ed 40K - a unit of rough riders made it through the enemy turn and dangerous terrain and overwatch and made it to combat! They even win this round, taking out four Grey Hunters. Take a close look folks; I doubt you'll see this sort of thing again anytime soon! 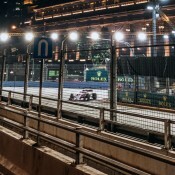 Glory is fleeting, and Fleet! 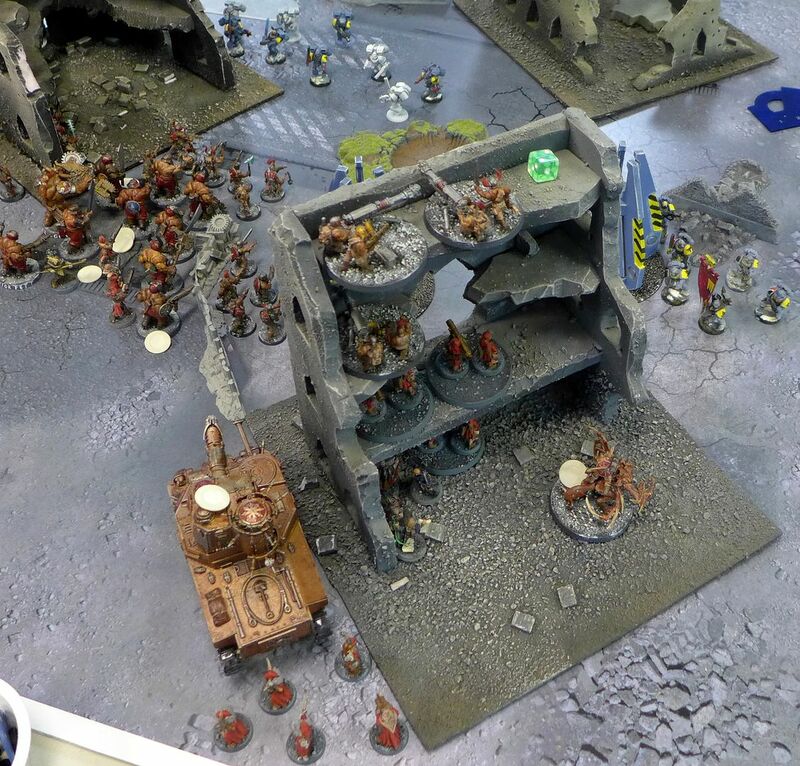 Blood Claws land on the left flank and shoot up some veterans (Beldasian Forge-fethers). Get the guy with the thing! 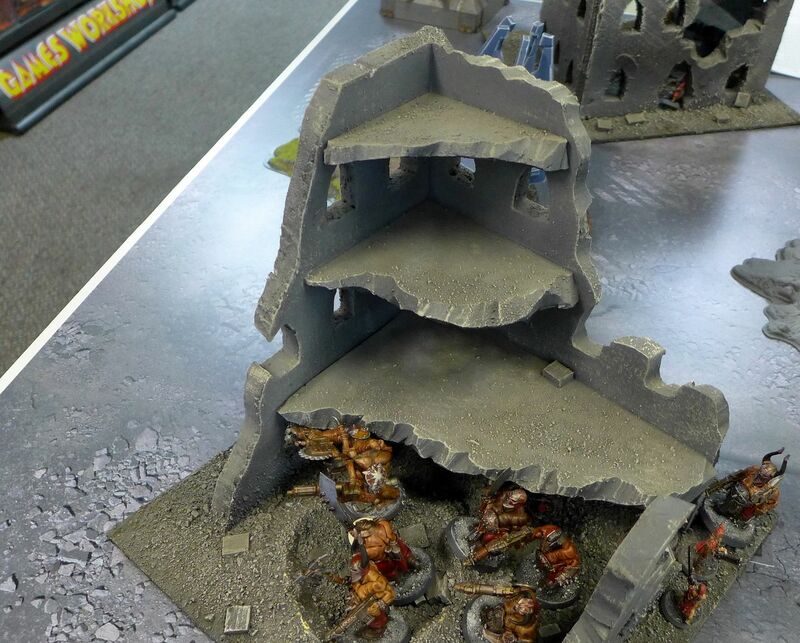 Right flank. 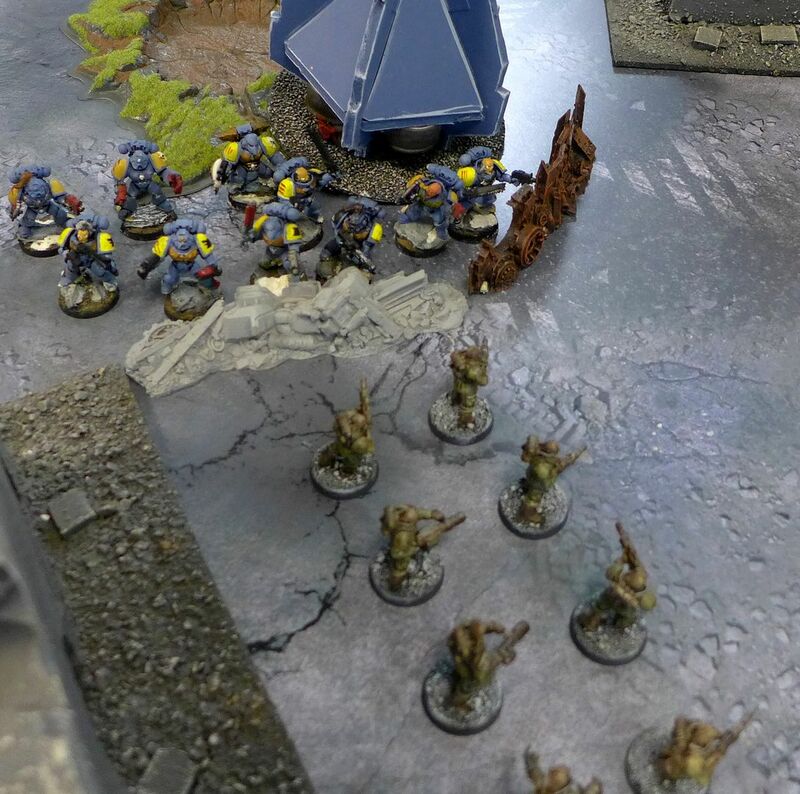 Grey Hunters move in on firebase, Skyclaws pull back, Scythiak surge ahead in the middle. No really. GET THE GUY WITH THE THING!!! 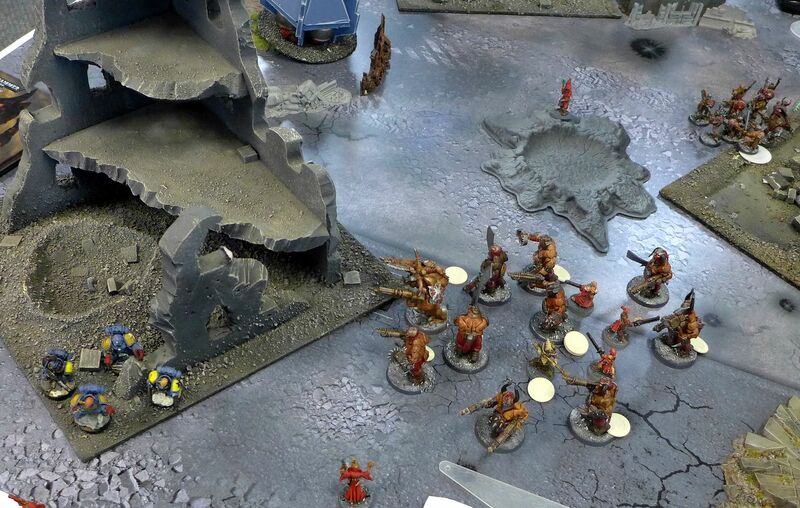 Summoned Bloodletters (fantasy swordsmen, as I hadn't brought any daemons along) prepare to deal with some marines. Belial in a target rich environment. 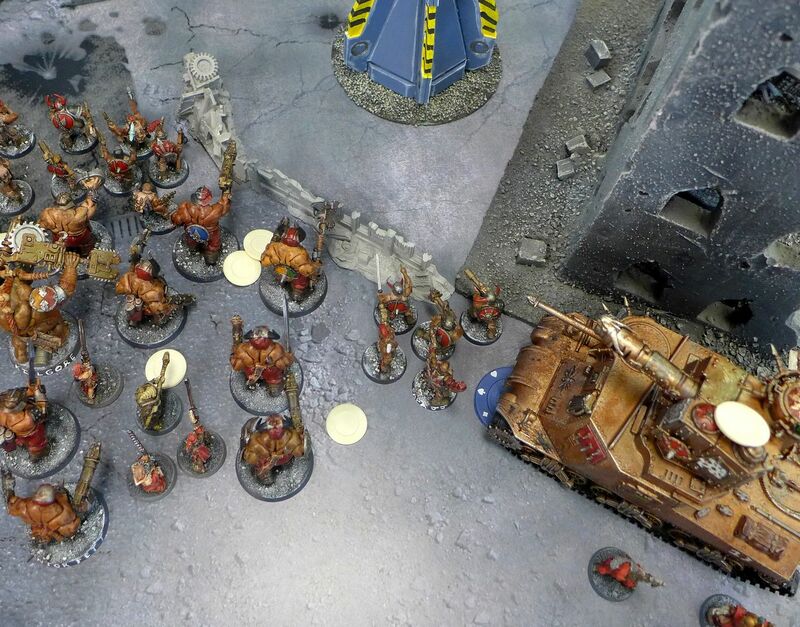 Blood Claws charge and take out the vets while Skyclaws move in to the left flank. 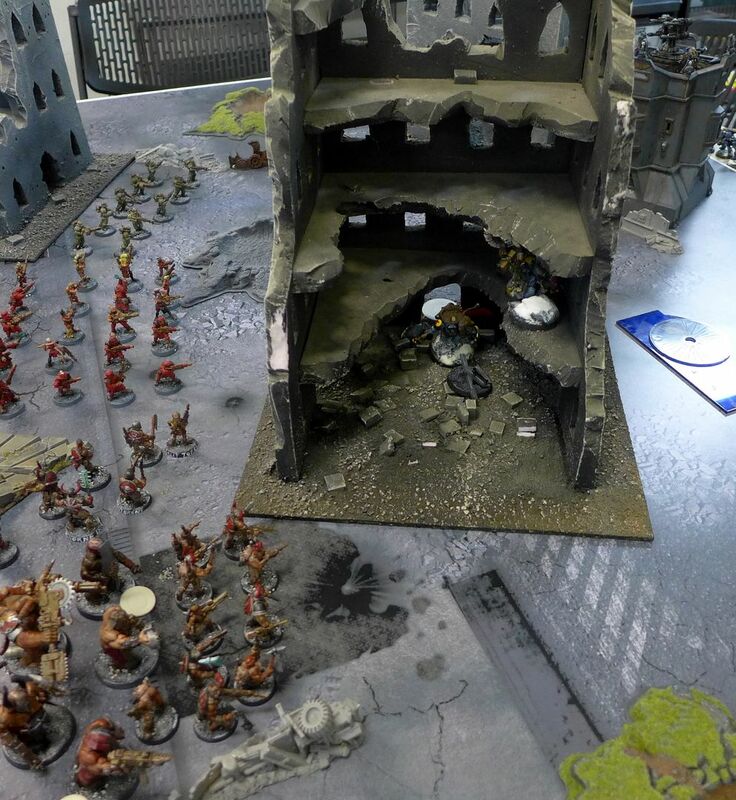 Coteaz survived the fusilade of the heretics and slipped back through the escape hatch to the bastion with the Relic. Curses! 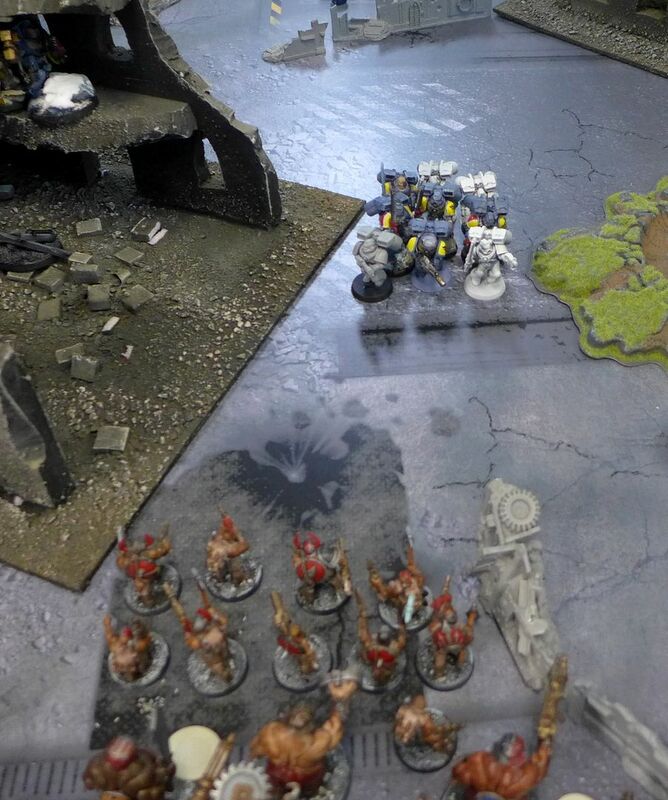 Ogryn and attached priests/psyker move to deal with marines. They've taken a lot of hits, but with angles and look out sir rolls the wounds kept getting spread around. 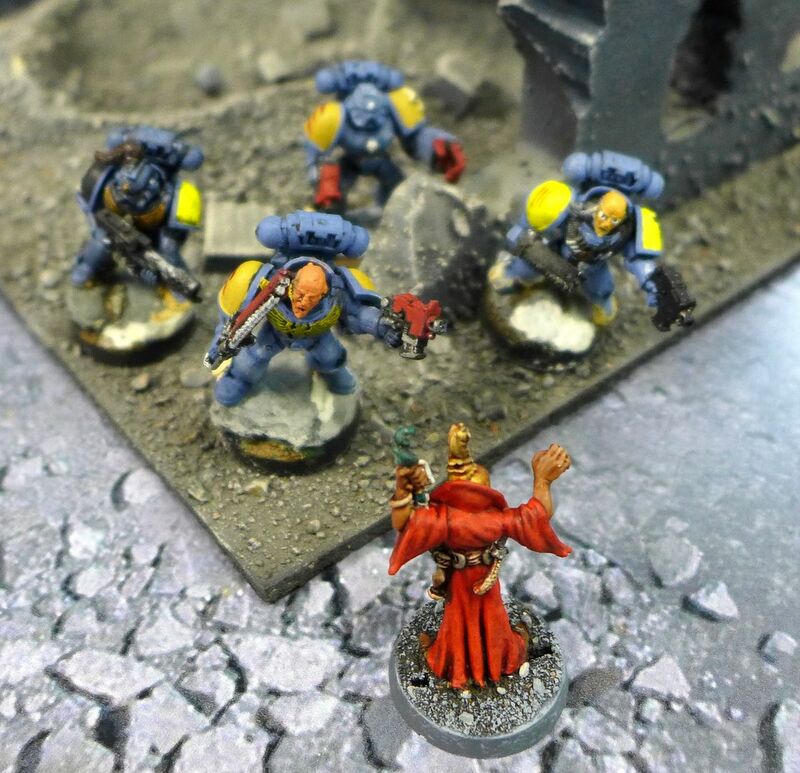 Blood Claws move in on mortar teams. Bloodletters have dispatched the Grey Hunters and have moved into the enemy DZ, while a Scythiak command squad tangles with the scouts. Unsuccessfully. 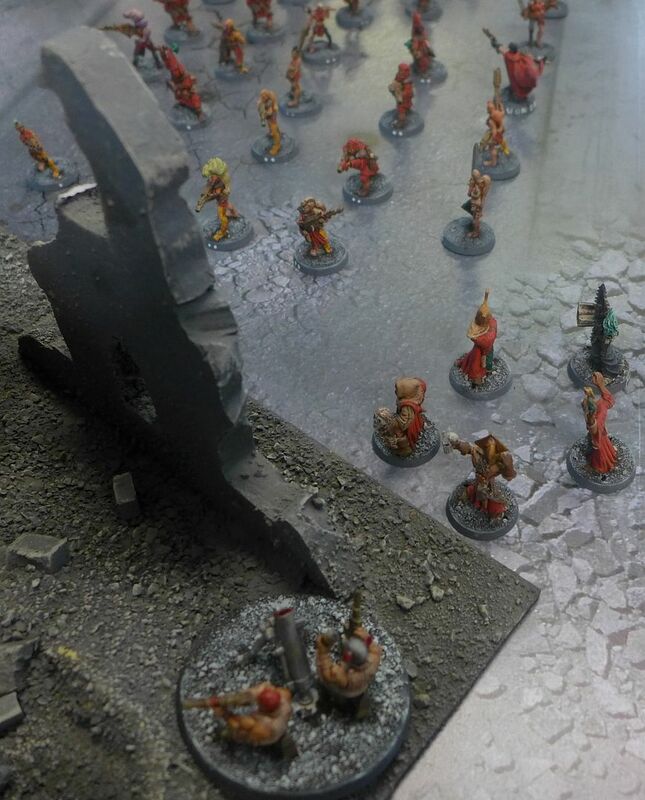 The scouts slaughter the heretics and consolidate back to their original firing positions. 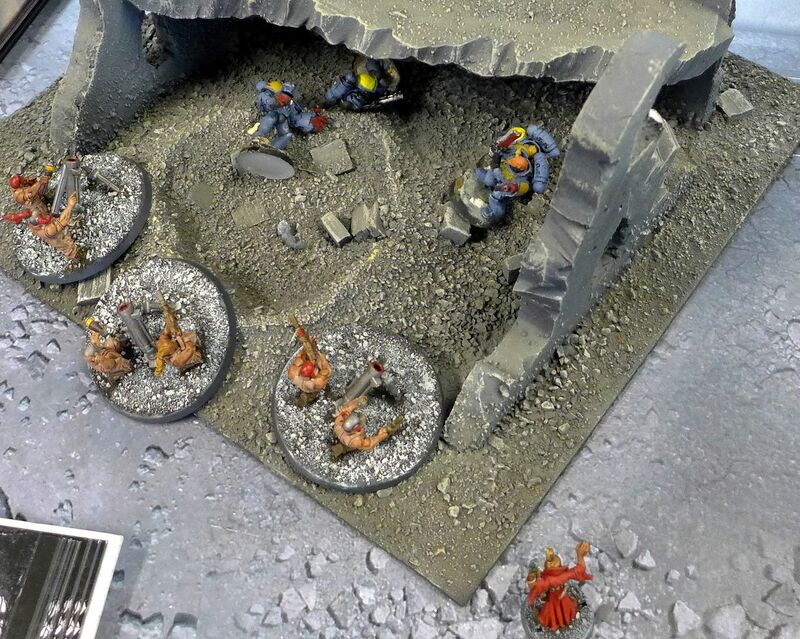 Blood Claws finish mortar crews and move in on a psyker. 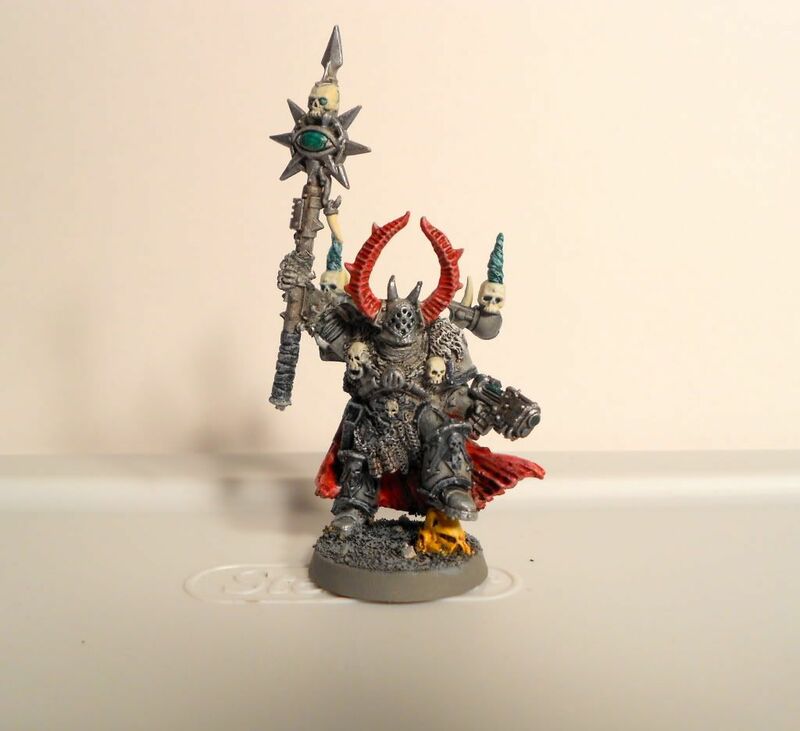 But Ogryn have other plans. I was definitely on the back foot here, with the Relic hiding out in the bastion. I have been sending shots its way, to no avail. Then Scott's Warlord (rune priest) kills himself on a perils of the warp check and the game is open again - even if Scott keeps the Relic, I might be able to get a tie now if I can get linebreaker as well, keep my own warlord safe and kill off the Blood Claws to keep Scott from getting linebreaker himself. Two down! I also finally crack the bastion when Scythiak gunners line up their lascannons and jury-rig them for continuous stream, burning out the weapons in the process but exploding the fortification! 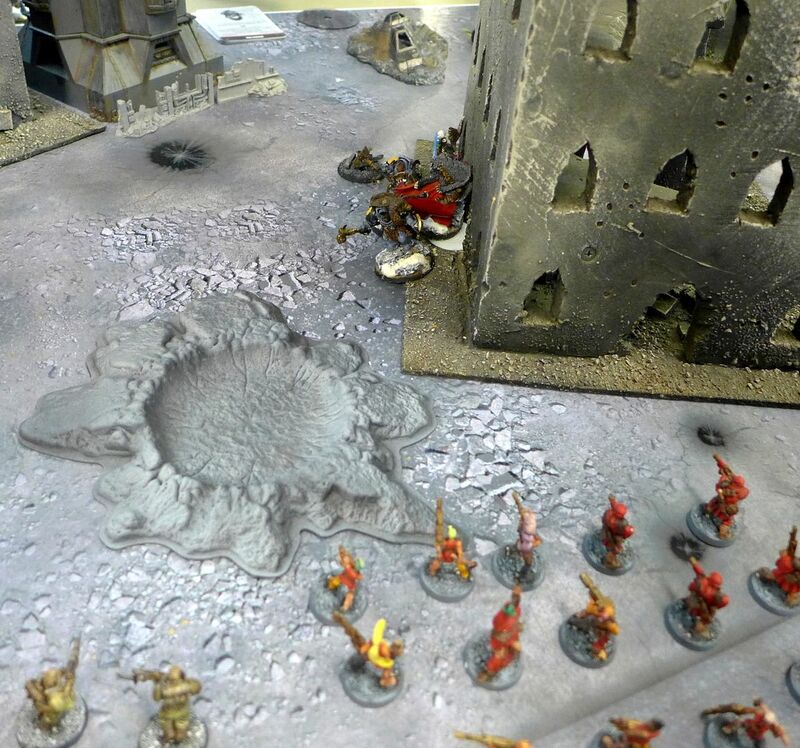 The wolves take heavy casualties but stay on the table and hold on to the Relic. And then there were none! Whew! Despite the Wolves stealing the initiative and getting the Relic right away through some luck, determination and the blessing of the dark gods I had managed to claw back up to a 3-3 tie by getting all the secondaries and keeping him from any. 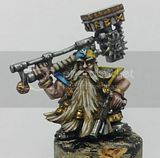 This weekend I plan to bring Astrakenor along to have him hunted by some Dark Angels and get some actual league games in. Seriously- that was staged- tell the truth! 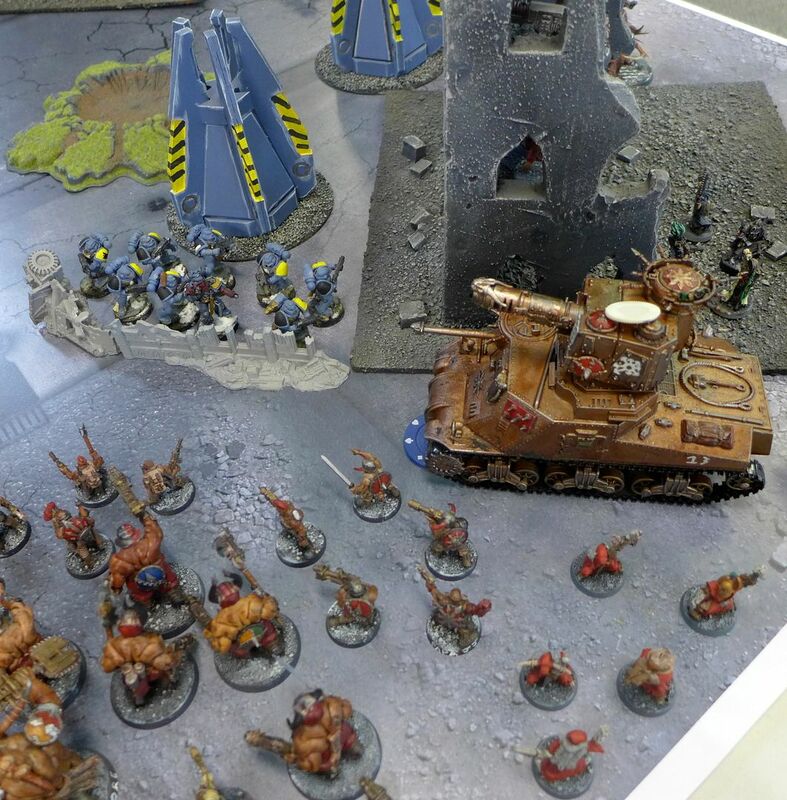 Nice work on the draw, and if he couldn't win that game with all the advantages he had (including list quality- Space Wolves + GK > Astra Militarum w/Rough Riders and a single Demolisher), then he needs more practice! It's the truth I tells ya! He went big, and the dice didn't cooperate. If he had concentrated his initial attack a bit more he could have definitely killed at least one thing instead of wounding multiple units. That alone would have been enough to sway things his way for VPs. Also maybe using a pod squad to grab the relic and let the terminators get stuck in to my lines could have worked out better IMO. Even so, it was very close, and only his warlord killing himself gave me hope of a tie. Not perilsing himself to death or some better saves on the Blood Claws and he still would have won.